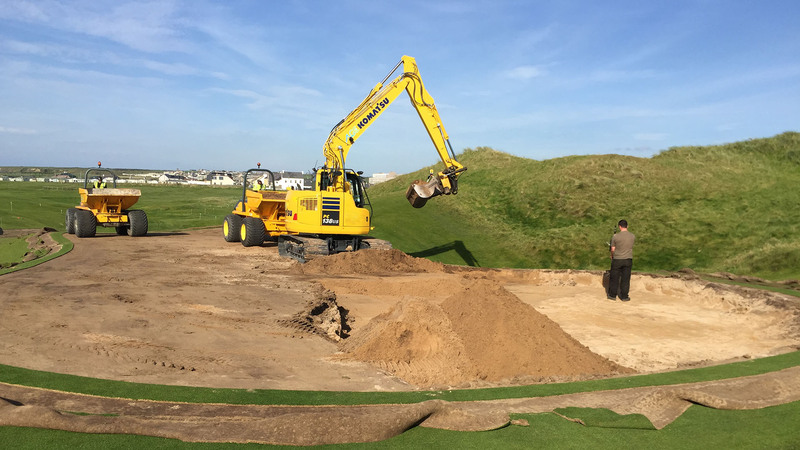 Works have included a complete renovation of all 18 green sites, replacing an old, tired and poorly performing rootzone, with a new rootzone mix. Greenside bunkers have been revetted. Greens surfaces were returfed using proprietary turf grown in the club’s own 2HA turf nursery. Tee complexes have been reshaped with the creation of new dunescapes, allowing for a more natural links type feel about the tees. Gravel pathways have been replaced by natural turf paths winding and sitting very natural into the impressive dunescape topography. Irrigation has been upgraded on all green sites and on the tee sites that have been rebuilt. Kitty’s River has been widened and renovated. Bridges have been constructed using the same natural stone to good effect. Construction of 2Ha turf nursery. Complete renovation of all 18 Greens sites on the Old Course by installing a new growing medium and proprietary grown fescue turf grass sod. Rebuild of 7th green site to new design. Re-turfing of complete areas of green surrounds. Reconstruction of tee sites, including the creation of new dunescapes to sit the tees more naturally into. Replacement of old gravel footpaths, replacing with new turf paths winding more naturally through the highly impressive Dunescapes. Major Dunescape Development on holes 7, 8 and 13. Including formation of Dune shapes, sprigging with Marram grass and hydroseeding. Installing new irrigation lines to all renovated greens and tees. Stone wall and Bridge construction (Kitty’s River).